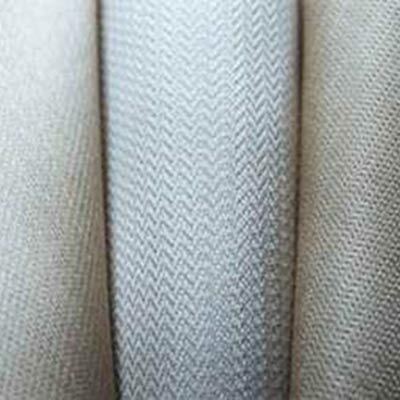 SIL Cloth | ZIRCAR Refractory Composites, Inc.
ZIRCAR Type SIL Silica Cloths consists of high temperature non textured amorphous silica fiber yarn, woven into an extremely strong fabrics. These non preshrunk textiles are ideal for applications with continuous use up to 1250°C (2300°F) or occasional excursions up to 1600°C(3000°F).These silica textiles are strong and easy to work with. They exhibit good handleability and remain flexible in numerous high temperature applications. They are extremely flexible and are resistant to most chemicals. Type SIL cloths are useful where non-RCF textiles are desired. Type SIL Silica Cloths meet Mil Spec MII-C-24576 type 1, Class 2. * Maximum use temperature is dependent on variables such as stresses, both thermal and chemical, and the chemical environment that the material experiences. Fabrication of High Temperature Clothing. Flexible and resilient gasketing, joints and seals. Personal shielding protection in welding, metal cutting and other high heat applications. Applications where a high temperature flexible form is needed. Note: These products can be further processed to provide finished sizes. Processes such as slitting, cutting, die punching and CNC machining are available upon request. Larger sizes are available upon request. ZIRCAR Type SIL Silica Cloths are available as tapes, ropes and sleeving. Please contact ZIRCAR at (845) 651-2200 for further details.